Over the past nine months, we scoured the web to find the most relevant coverage of the 2008 election from journalists, photographers, artists, and engaged citizens all over the U.S. and the world. Now that President Obama has taken office, we're going to be retiring this site, and Election Connection will no longer be updated. That said, PBS will continue to cover government and politics and keep tabs on the new administration with our news and public affairs programs. I'd like to take a look back at some of the best moments, comments and contributions during the election, and how they might inform the administration and the media in the months to come. In July (which feels like a VERY long time ago), we already had an inkling that the economy was going to get worse, but there was still hope that it wasn't a full-on recession (or what some are now calling a depression), as this Nightly Business Report piece examined. Reader P. Cover commented: "I am in bankruptcy, my home in foreclosure. I blame the amoral practices of big business. No more money for them. They can struggle like their victims - us!" Now, the new stimulus bill has been signed, and the media has re-focused its efforts from the election to the economy. Stories like those in NPR's Planet Money series are looking at everyday families in America and examining how people are coping with financial struggles. The conventions were an opportunity to experiment with new technologies and look back at the history of campaigns. At the DNC in Denver, Colorado, Rocky Mountain PBS got in the spirit with slideshows of the convention in Denver in 1908, and also hosted new events like I am the Library, a project inviting the public to share their thoughts on civic engagement. NewsHour used mobile-compatible sites like Twitter (for text updates) and Flickr (for photos) to give users a real-time view of what was happening on the convention floor. A photo feed also showed images from public media reporters all over the city, like Wolf Blitzer hanging out at the CNN Grill and bloggers congregating around smoothies in the "big tent" - a dedicated space for bloggers to congregate and report -- the first of its kind. VP speculating took the headlines for much of the summer, and taking a look waaaay back to John F. Kennedy's pick of Lyndon Johnson for VP in 1960 offered historical perspective. I found out about McCain's pick of Alaska Governor Sarah Palin on the flight from Denver back to Washington for a brief break between conventions. I was sitting in front of Rep. Eleanor Holmes Norton on the flight and she was as shocked as I was to hear the news. The Palin pick defined the Republicans in the 2008 campaign, and sparked countless arguments, online and off. While the Green Miles blog in Virginia posited, "Alaska Gov. Sarah Palin has been a champion of a different fight -- the one to try to keep the polar bear from being protected by the Endangered Species Act., the Flashpoint blog in Alabama opined: "I just watched Sarah Palin's speech - she is an absolutely wonderful choice for Vice President. She is right on issues, she is a great speecher [sic], and she exudes confidence. She also has more executive experience in her own right than does Obama." Will we hear from Palin again in 2012? Through a partnership with Patchwork Nation, we looked at trends across different types of communities in the U.S. This summer in Hopkinsville, Kentucky, Patchwork Nation founder Dante Chinni reported on soaring gas prices and how they affected how people were planning to vote. "Here in Hopkinsville -- a place that should be BIG McCain turf -- the hard times, strongly driven by gas prices, have many here thinking the election will be closer in 2008 than it was in 2004. If the price of a barrel of crude dips way down or climbs back up it's easy to imagine tens of thousands of votes swinging." After an exciting experiment using user content in debates with the YouTube/CNN primary debates, the lack of openness during the official presidential and vice presidential debates was a bit of a disappointment on the social media front. But the hype over watching Sarah Palin take on Joe Biden in the vice presidential debate, and the feeling that the election was close at hand in all three presidential debates gave the campaigns a shot of much-needed adrenaline in the lull following the conventions. As Election Day approached the feeling in Washington and nationwide was electric. Would there be long lines at polling places? Would the votes be counted fairly and accurately? News reports of faulty voting machines and ill-equipped polling places were getting people nervous. Through the Video Your Vote project , we helped people record their experiences, creating a comprehensive tapestry of November 4 - from problems like voter caging in West Virginia to inspiring stories of first time voters. In addition, Vote Report allowed people to report their experiences at the polls online in real time. How will this transparency affect future elections? I've lived in Washington for most of my life, and Tuesday, January 20 was like nothing I'd ever seen in this town. The population doubled, people were smiling despite the freezing temperatures, and there were parties on every corner, from the local pub to the fancy hotels to the bars of historic U Street. I was lucky enough to check out events like the Manifest Hope party, celebrating art about the election, and spent Sunday with thousands of others on the Mall, watching the We are One concert. Now that Washington has returned to normal, there is a whole new breed of politicians and hopefuls moving here to work for the Obama administration or just to be around it. We'll be there as the new administration continues to get settled. The best resources to find news and public affairs analysis at PBS include the Online NewsHour, Bill Moyers Journal and the Bill Moyers blog, NOW on PBS, Washington Week, and Tavis Smiley and Tavis Smiley's Young Voices blog. In addition, you can always find exciting social media work and program content on PBS Engage and the Engage blog, where I'll still be writing about a variety of issues. Thank you so much for your input, time, and excitement around Vote 2008. Washington is starting to clear out - the celebrities have gone home and the Obama administration is starting its real work in the White House. But we can't forget about a weekend that will be remembered for generations. The inauguration festivities were tracked in a totally new way this year - with a lens into the festivities from the people from around the country who suffered through sub-freezing temperatures and ran around a sometimes-confusing city whose population more than doubled over the weekend. In addition, new technologies gave way for in-depth looks at the festivities, from close up and afar. For a bird's eye view of the day on the National Mall, NASA provided satellite images, tracking the migration of over a million people gathered from the Capitol to the Lincoln Memorial. Flickr's Inauguration Day project gathered photos from people watching the festivities from near and far, in living rooms and offices and intersections. The first presidential address to be streamed online was former President Bill Clinton's second inaugural in 1997, but now the addresses of all former presidents are available online, and the interactive aspects of yesterday's event show how much has changed. CNN and Facebook partnered so users could read status updates while watching the day's events and Inaugurationreport.com showed live text updates from around the world. To relive the moment and hear the full inaugural address, check out Online NewsHour's text, audio and analysis of yesterday's events. And for a firsthand view, on YouTube, hundreds of videos show up in a search for "inauguration day". As the parade marches down Pennsylvania Avenue and the Washington elite primp for the inaugural balls, it's a good chance to take a few minutes in the quiet afternoon to reflect on year - in politics, online and in the country as a whole. Tavis Smiley's Young Voices blog has a running list of observations and hopes for the Obama inauguration and administration, including expanding Change.gov and rethinking who is eligible to be a VIP at the presidential events. "Expectations are a dangerous thing. I kept waiting for the JFK/FDR moment when he'd say something that truly resonated, that would give us a line or a concept that would take on a life of its own. Perhaps he purposefully kept the soaring oratory to a minimum, to squelch the naysayers who think he's all speechmaking and no substance?" At exactly 12:01pm ET, WhiteHouse.gov shifted to a new design, mimicking the Obama campaign website and featuring a blog with news from inside the new White House. In the first post, blogger and Director of New Media Macon Phillips wrote: "Just like your new government, WhiteHouse.gov and the rest of the Administration's online programs will put citizens first." With the feeling of unity in Washington today, it's easy to forget that the 2008 election was a close one and there are still deep divisions in U.S. politics. You can share your thoughts on former President Bush's legacy on NOW's website. How did you watch the Inaugural events? If you were there, tell us about it. Here are some easy ways to follow the inauguration of Barack Obama as the 44th president of the U.S. online. Online NewsHour's live video stream of the event will be co-hosted with NPR starting at 11am. There's also an interactive map. Watch all the past inauguration speeches, from George Washington to George W. Bush. 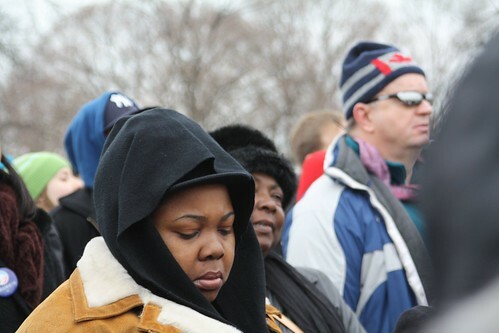 Follow live reports from the event and share your own on Twitter with the tag "#inaug09. or check out the Current TV mashup. I'll be keeping track from http://www.twitter.com/laura_pbs. Share your photos from Washington in the Flickr photo pool and check out scenes from around the city and the world documenting today's historic events.